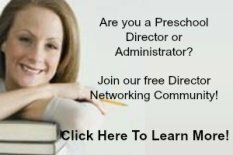 This Ocean Life Theme page is filled with preschool lesson plans, activities and ideas for your classroom. 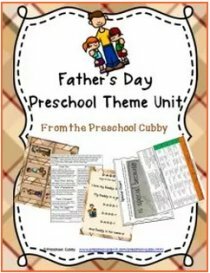 There are so many more activities and ideas that can be added to this theme! Go for it! 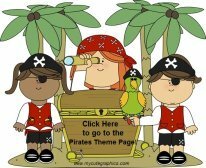 Add your seashells, fish and other theme ideas to create a month long Beach or Ocean Theme! 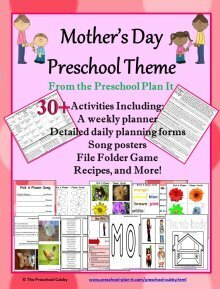 You'll find more themes to help you with your planning on my preschool themes page. 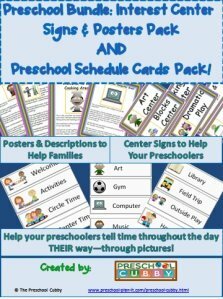 You can either scroll down through this page to see all of the preschool activities or click the link below to go to specific preschool activity types you are looking for. Place paper in the cookie sheet. Place different colors of paint on the paper. Place the magnet balls on the paper. Place the cookie sheet on a few unit blocks to elevate it. The children place the magnet wand under the cookie sheet and move it around to move the magnets through the paint! Materials Needed: Provide blue and green fingerpaint. They can make waves. When dried, glue on fish stickers! Add ocean life stuffed animals for the children to build coral reefs for! Materials Needed: Provide 4 pictures of ocean items and one unrelated (such as a bicycle). Ask which does not belong. Bring a lot of pictures to play over and over. Place the paper towel around the rock. Place it in the can and cover it. The children take turns shaking the can. When you remove the rock from the can and unwrap it, you'll see sand in the towel! Snack Recipe Ideas to Cook Up for Your Ocean Life Theme! Ask many questions while cooking with your children to encourage conversation! 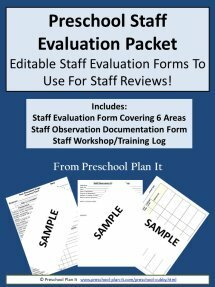 Be sure to ask specific theme questions while making these fun snacks! Put cream cheese in a bowl and gold fish in another. The children spread the cream cheese onto the celery and then place some goldfish on top. The children use the cookie cutter on the bread. Then spread butter on their star and sprinkle with grated cheese. Toast them in the oven and eat when cool. Provide beach bags that are packed with towels, sunglasses, visors, pails, shovels, empty suntan lotion containers, plastic snack food, swimmies and other items you can think of! More Than Just Painting (Although that is always THE favorite in our classroom)! Tape different sized paper fish on the easel. Hang a large piece of white paper over them. Provide crayons with the paper peeled off. Show the children how to rub the paper with the sides of the crayons. Encourage the children to count how many fish they discovered. to help your children build their muscles while they have fun together! Ocean Life In the Dell! The shark under the sea, the shark under the sea. The shark under the sea. The hermit crab takes lobster, Etc. In advance, make 5 seashells to use on your flannel board or use real seashells. Five little sea shells lying on the shore. Swish went the waves and then there were four. Four little sea shells cozy as could be. Swish went the waves and then there were three. Three little sea shells all pearly new. Two little sea shells sleeping in the sun. Whispered, "SHHHHHHHHH" as I took it home. 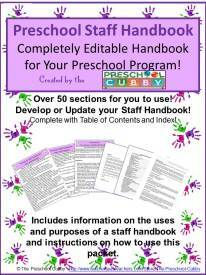 to help your preschoolers develop math skills and those small muscles in their hands! Provide a large variety of shells for the children to sort by color, size, texture, etc. Use milk caps to stick ocean life stickers onto. Flip over the milk caps to play a fun memory game. The children should "swim" while the music is playing and then freeze when it stops. This is a take on 5 Little Monkeys! Five little fishes swimming in the sea. Teasing Mr. Shark: You cant catch me! Along came Mr. Shark as quiet as could be and........SNAP! Four little fishes swimming in the sea... continue until no little fishes are swimming in the sea! Five little fish went swimming one day. Over the sea and far away. When the mommy fish called "Come back! Come back!" Only four little fish came swimming back. "then a great big whale came swimming past and five little fish swam back so fast!" 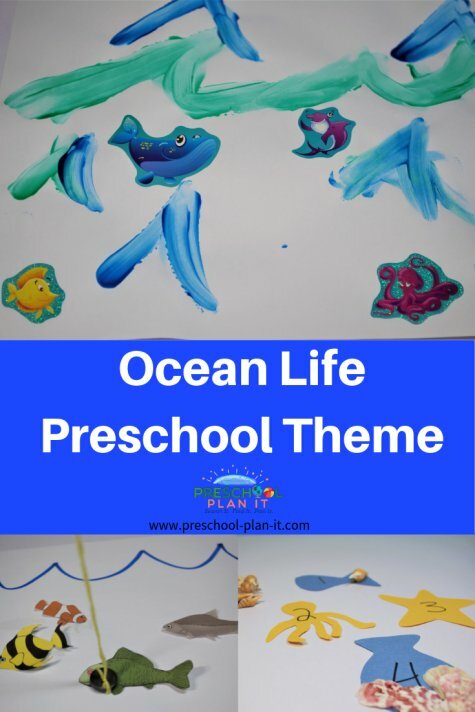 Ocean Life Theme Ideas for Your Sand and Water Table! 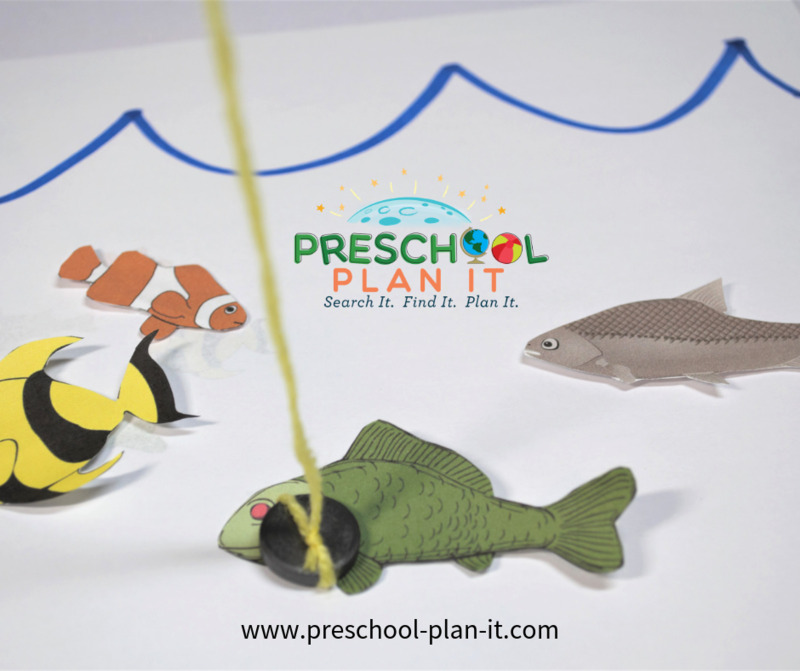 Have items available for the children to use to see if they will sink or float in your water table. Some suggestions: paper clip, sponge, crayon, plastic straw, etc. Have the children guess if it will sink or float before dropping it in. Materials: Add seashells and plastic sea animals to your sand table for some fun. 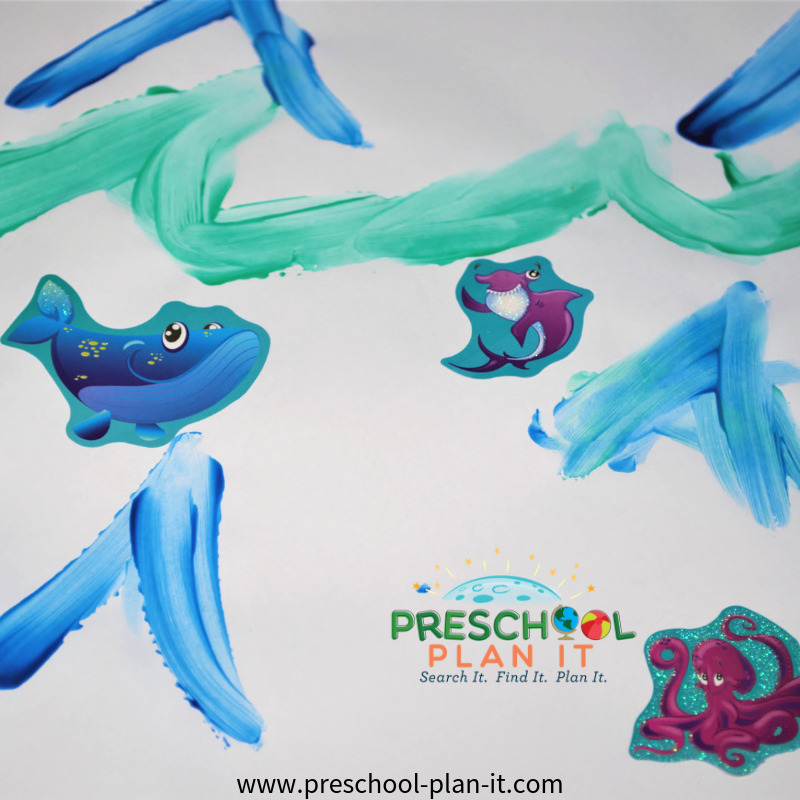 Ocean Life Theme Science Ideas for Your Preschool Scientists in Training! Materials Needed: Clear soda bottles make great discovery bottles. You can use small water bottles or large 2-liter bottles! Wave Bottle: Fill bottle about half full with water. Add a few drops of blue food coloring and shake well. Fill the rest of the jar with mineral oil...fill this right to the top. Hot glue the top on. Hold the bottle sideways and gently tip it to create waves. Extension: You can add sequins or sequin fish shapes for fun also! We've also added plastic sea animals such as sharks or other fish. Fill a plastic bottle with sand. Drop ocean items or any familiar items into it. When the children turn the the bottle around, encourage them to name the items they see. Tie one end of yarn to the edge of the ruler. Tie a magnetic circle onto the other end of the yarn. Attach a paper clip to each of the pre-cut fish. 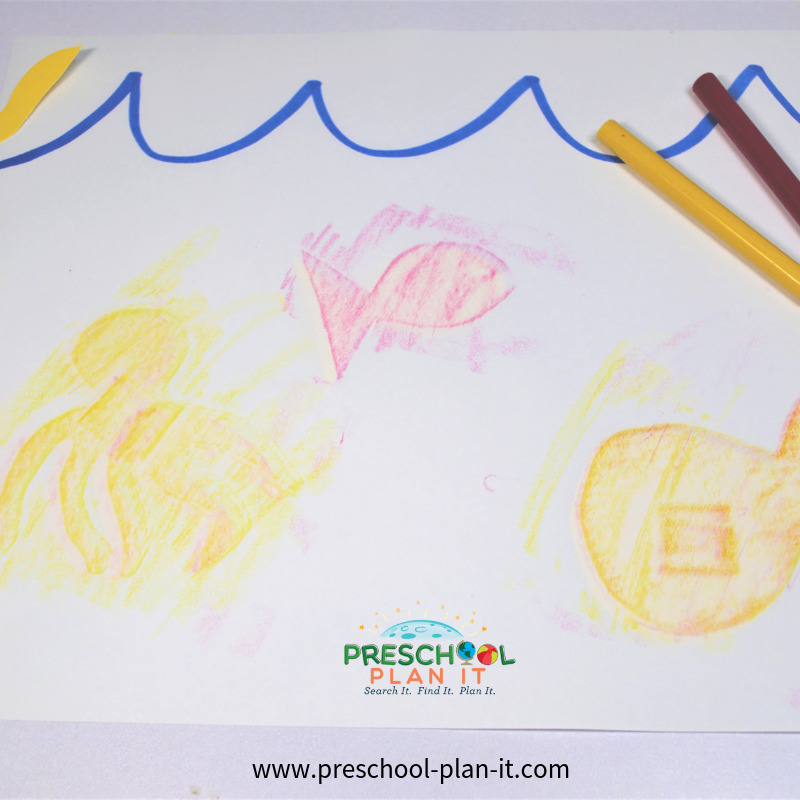 Writing Activity Ideas for your Ocean Life Theme! Encourage the children to tell stories about their pictures and write them down.